Oh...Kitty! I'm so glad you were blessed through this exchange! What elegant the cups... And the note pads are too sweet! I was so thrilled to join in Stephanie's delightful exchange again! Hello Kitty, oh I love everything that you received from the tea cup exchange. I know you are going to enjoy everything especially the cookbook. Thanks for sharing this at C&C with J&J. Enjoy the week. You had a very nice exchange package. All very useful. Thank you, my friend, for joining the fun once again. You are a dear lady! Love and hugs to you! What a special package you received, Kitty! The apron is really cute and the teacups are lovely! 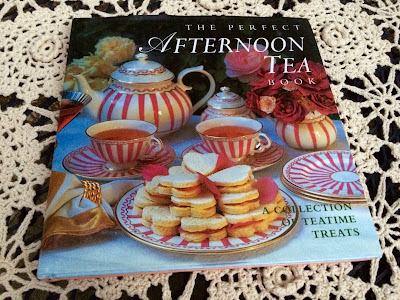 I love the tea book and what fun you will have making the recipes from that. You are cute as a button modelling the apron and I love your Tea shirt! I also adore red! Have a beautiful day and enjoy your gifts. Dearest Kitty - oh your exchange treasures are simply wonderful! Doniene did such a great job picking each item - so perfect for you! Isn't Stephanie wonderful for putting these together? What an angel! Such a lovely package from dear Doniene! 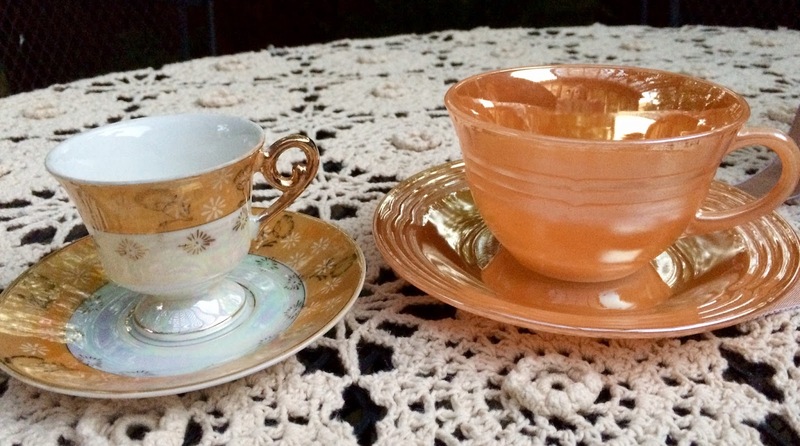 My those are gorgeous tea cups and both graced with the sweetest of treasures that I just know you are going to enjoy, Kitty. I had the pleasure of receiving a beautiful tea cup from Laura. She is a new blogger for me and it's been enjoyable to follow along with her. She is quite creative, that is for certain. What great gifts! I'm crazy over the handmade items especially. Blogging friends are the best! What a lovely package. I will be sharing my goodies on Wed. I'm so glad I found this exchange, it's such fun to make new blogging friends. Happy new week! Kitty, you look adorable in your sweet new apron! What a wonderful exchange! I completely forgot about it. I'll try to remember next time, Stephanie hosts it again. What a delightful box of goodies! How thoughtful of Doniene to remember your grandkids and the kitchen linens are perfect for your kozy kitchen. I'm sure you'll enjoy many tea times using the pretty translucent cups and saucers. I'm also loving the box of various tea flavours. P.S. I adore the super cute "Favourite Tea Shirt"! What a lovely parcel of goodies you received from Doniene. The exchange is such a fun idea. I took part this time, too. I'm sure you'll enjoy using the pretty things from this exchange. Don’t you just look pretty as a picture?!!! 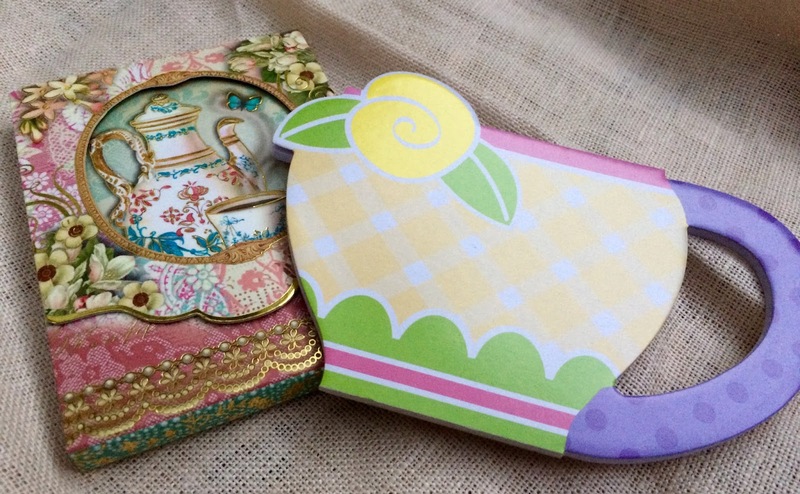 Congratulations on your pretty teacups and notepads! I use those notepads A LOT!!!! You certainly had every right to be excited about receiving your swap gifts! The hand crafted apron and potholder is so beautiful and you look lovely in the apron. I also have that book and know you will enjoy reading every page. Have a great week! Look how stinkin' cute you look in your apron!!! Such beautiful and thoughtful gifts you received. Are you rubbing it in by sporting flip flops while I'm dying up here in the cold, damp grayness???? 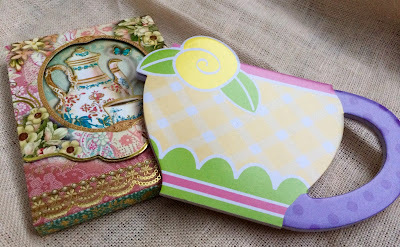 Lovely treasures!Love all your gifts,the teacups,the beautiful book,the pretty apron!Hugs! How exciting! That book looks wonderful and the cups are beautiful. I know you were thrilled. And there's more! Wow... You will enjoy everything I am sure. What a nice gift. 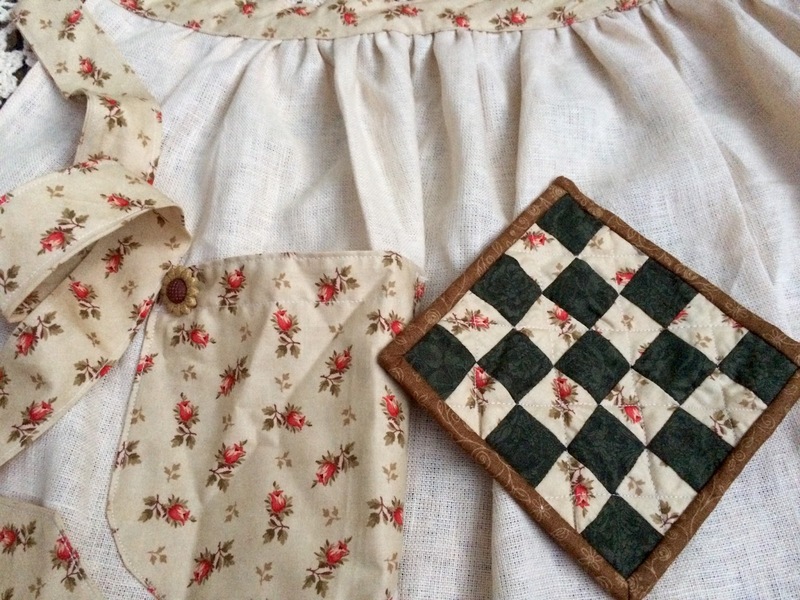 The apron and potholder was a labor of love from Doniene. So nice. Wonderful Kitty! How fun! And I just love the Teacups and wonderful apron. The book looks like a treasure too. I am sure we will be privileged to see something from it soon! Wow! Kitty, you hit the jackpot! I love the teacups and it's wonderful that there's one for you and the Grand! Have fun baking! Delightful! You look fabulous in your new apron. The peach Fire King is so pretty. I remember a few ladies who had them back in the day. Very nice gifts. What a fun exchange. What fun to visit you and 'hear' your obvious delight in all your treasures you received! 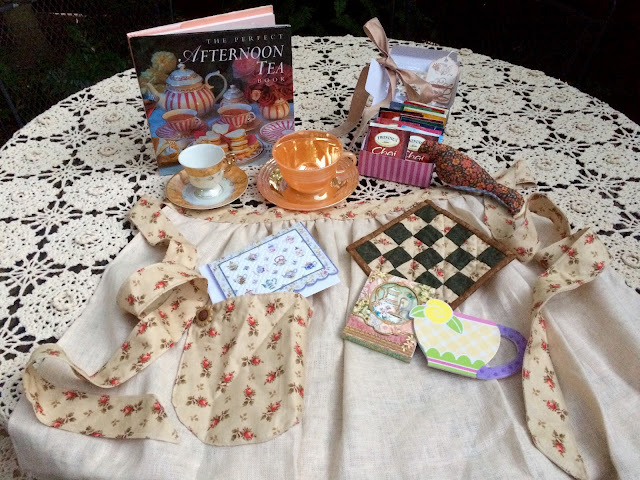 Oh the sweet gifts that you got from Doninene are just beautiful, and I love how you are modeling the apron that she made you with your cute tea shirt! How nice that she made you a matching pot holder too, it's such a lovely package of tea and joy in one package! 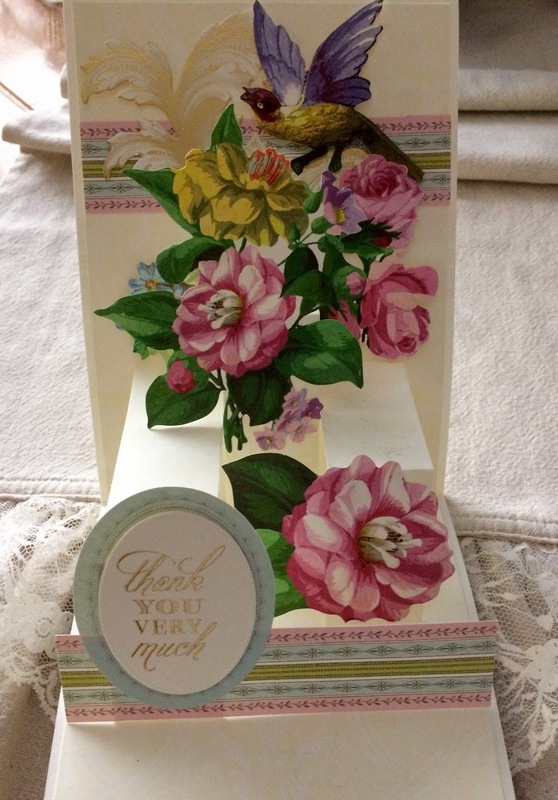 I haven't seen what you sent to Laura yet but the card that she sent to you is gorgeous, she is a very talented gal! Hasn't it been such a delight to be a part of this Tea Exchange! What lovely gifts you received!! Kitty, I always love your posts about Stephanie's teacup exchange. What fun! Someday I will get it together and do it. Kitty, the peach luster tea cup is gorgeous!!! What fun you and your granddaughter will have sharing tea together. How cool that you've been taking part in the exchange from the beginning! This was my first time, and wow, it was such a sweet and cheering experience. I can't wait to do it again. That peach teacup is beautiful! So luminous. I'm finally able to reply...been in TN with the family so I can now get caught up! Do you know that I almost bought someone a Peach Luster cup exactly like the one you received for one of my partners over the last few years since I've been doing this...I forget now but I don't think it was you. And you got two cups...wow! What a lovely box of goodies you received...so many wonderful things...and you look adorable in your new apron! Dear Kitty, What a beautiful package of gifts you received in the exchange. I love your lusterware cup and the sweet small one too. The apron and potholder are incredible. 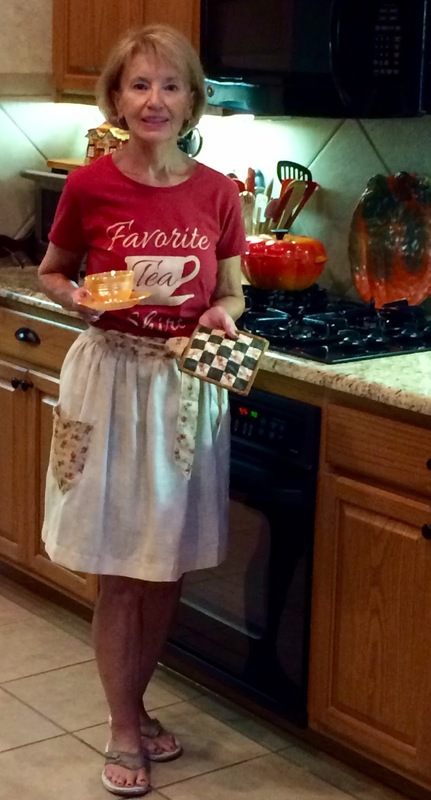 You look so cute display your gifts in your darling "tea shirt" I'm sure Laura was very blessed to by your lovely gifts sent to her. Stephanie does such an amazing job pulling the exchange all together. Lovely post Kitty. Have a beautiful week ahead. Such lovely gifts and such a nice picture of you, Kitty! I always look forward to the teacup swap reveal. Happy November to you! Your Teacup Exchange always looks like so much fun! Your post is awesome and thanks so much for sharing it with us at Full Plate Thursday. Hope you have a great week and come back to see us real soon! What a fun time you gals have in this exchange. It is very popular. I love the items you received and especially the apron which is very useful! Thanks for sharing and I think your Grand Daughter will love the demi sized cup and saucer. Such a fun exchange and I love your gifts! And how cute are you my friend? Thanks for sharing with SYC. Good morning my teacup friend!! A busy season for me and I’m just getting checked back into blog reading! 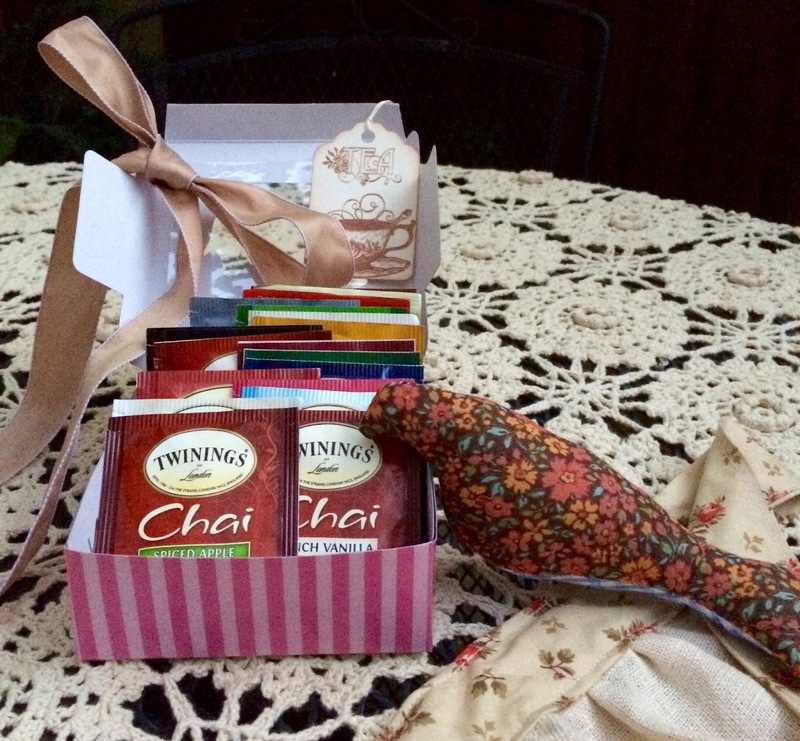 I am thrilled that you have enjoyed your tea goodies! And yes, I thought of your sweet granddaughters sharing a cup of tea with you! What a lovely package you assembled for Laura! Hope all is well with you! Blessings and hugs!